Nile monitor lizards (Varanus niloticus) and Burmese pythons (Python bivittatus bivittatus) have become established in southern Florida. Both are large semi-aquatic predators that threaten the unique ecology of the area. The introduction of both species is probably the result of intentional releases by reptile dealers and reptile enthusiasts. Agile, aggressive, intelligent and readily commensal Varanus niloticus can swim, climb, run, and dig, facilitating the consumption of a wide array of marine, fresh water, terrestrial and arboreal prey, and is also known to hunt cooperatively (Campbell 2005). It is also the longest lizard in Africa, attaining a maximum of 243 cm TL (total length) (Faust 2001, in Enge et al. 2004) and weighing up to 8.1 kg (Faust & Bayless 1996, as cited in Gore et al. n.d.). Dorsally the color is gray-brown or dark olive with darker reticulation, and 6 to 9 bands or bands of yellow-gold ocelli in adults; juveniles are a more brightly patterned black and yellow (De Lisle 1996, Branch 1998, Spawls et al. 2002, Lenz 2004, as cited in Somma 2007). The tongue is blue (Bennett 1998, Campbell 2003, as cited in Somma 2007). These lizards have large, strong claws, a neck longer than the narrow-snouted head, and a laterally compressed tail (Steel 1996, Lamar 1997, Branch 1998, Lenz 2004, as cited in Somma 2007). Two former subspecies, V. n. niloticus (Linnaeus 1758) and V. n. ornatus (Daudin 1803) are now considered distinct species based on morphology (Böhme & Ziegler 1997, as cited in Enge et al. 2004). Growth rates depend on whether the population is exploited or not (see Buffrenil & Hemery 2002). Rapid growth and early sexual maturity both contribute to a demographic accommodation in exploited monitor populations (Buffrenil & Hemery 2002). Anecdotal observations suggest the species may live for as long as 10 to 15 years (Buffrenil & Hemery 2002). 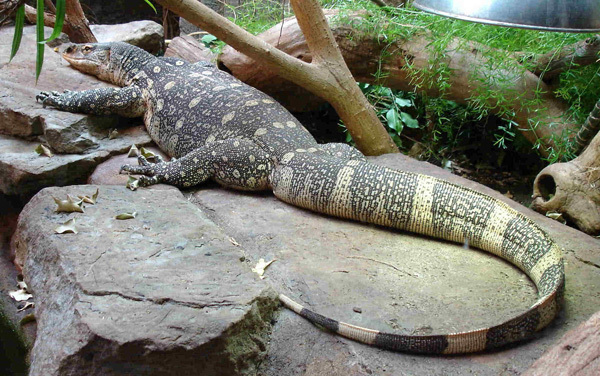 In its native range in Africa the Nile monitor is exploited for its meat and skin (Luxmoore et al. 1988, in Bennett 2002). For a review of its use as food and leather in some regions of Africa see Buffrenil 1993. In its introduced range it is sold as a pet with hatchlings retailing for as little as 10USD (Enge et al. 2004). Few lizard species are less suited to life in captivity than V. niloticus because of its large adult size and nervous disposition (Enge et al. 2004). This adaptable lizard is not habitat-specific and can be found almost anywhere permanent bodies of water exist. In its native range the Nile monitor ranges throughout sub-Saharan Africa except for desert regions; it occurs along desert fringes and from grasslands to rainforests in the vicinity of rivers, swamps, ponds, lakes, and seashores (Enge et al. 2004). Monitors readily inhabit human settlements and cultivations, often foraging around rubbish dumps and sheltering in crevices or burrows, including those of other animals (Enge et al. 2004). They are mainly aquatic during activity periods, often hiding in dense vegetation in shallow water (Buffrénil and Hémery 2002). Nile monitors have been recorded as high as 2 000 meters above sea level (Barbour & Loveridge 1928, in Gore et al. n.d.). In its introduced range in Florida the most suitable habitats for the Nile monitor are probably mangrove swamps, edges of freshwater and saltwater marshes, and banks of rivers, canals, and lakes (Enge et al. 2004). The tidal creeks, marshes, and swamps of Charlotte Harbor State Buffer Preserve and Matlacha Pass State Aquatic Preserve on the west side of Cape Coral probably represent core activity and feeding areas (Enge et al. 2004). In Africa female Nile monitors oviposit in burrows or active termite mounds from August to early January (Bennett 1995, Branch and Erasmus 1982, de Buffrénil and Rimblot-Baly 1999, in Enge et al. 2004). In Mali and Chad females reach sexual maturity at about 36 cm SVL (snout vent length) or 24 months of age, and about 50% of mature females reproduce each year (de Buffrénil and Rimblot-Baly 1999, in Enge et al. 2004). Small females typically oviposit 12 to 13 eggs, whereas large females (greater than 71.5 cm SVL) oviposit 53 to 60 eggs (de Buffrénil and Rimblot-Baly 1999, in Enge et al. 2004). Eggs apparently take 6 to 10 months to hatch in the wild (Cowles 1930, Faust 2001, in Enge et al. 2004). In Cape Coral (Florida, United States) Nile monitors reproduce between April and September and hatchlings appear mainly between February and April (Campbell 2005). This generalised feeder consumes a wide variety of invertebrates and vertebrates through hunting, scavenging and digging (Bennett 2002). Juveniles may be insectivorous (feeding mainly on hymenopterans and coleopterans) but are also reported to feed on arachnids, amphibians and crabs (Auffenberg 1994; Bennett 2002). Adults may feed on arthropods, crabs, crayfishes, mussels, gastropods, fish, anurans, lizards, turtles, snakes, young crocodiles, eggs, birds, small mammals, carrion, and human food scraps (Bennett 2002, Branch 1998, Cissé 1972, Cott 1960, Cowles 1930, Edroma and Ssali 1983, Lenz 1995, Losos and Greene 1988, in Enge et al. 2004). The Nile monitor is one of the most important predators of Nile crocodile eggs and young (Cott 1960, Mohda 1965, as cited in Enge et al. 2004). Adults may feed also on neem seeds (Azadirachta indica) (Bennett 2002). The lack of fat accumulation in these animals suggests they do not undergo extended fasting periods (Bennett 2002). Stomach content analyses and observations by Campbell (2005) of specimens from Cape Coral (Florida, United States) revealed that their diet is extremely broad including many taxa of invertebrates and vertebrates, whole clutches of reptile and bird eggs and one adult Florida burrowing owl. Increased popularity of exotic reptile pets has led to a currently booming trade of exotic reptiles and intentional or accidental release by pet owners and dealers has become the major cause of recent reptilian introductions (Hoover 1998, Kraus 2003, as cited in Fujisaki et al. 2010). 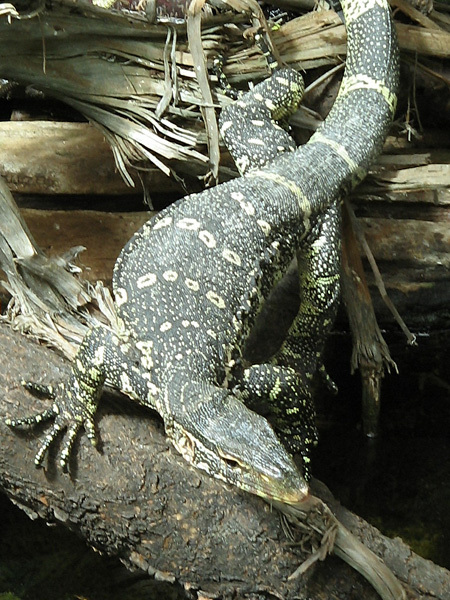 Recommended citation: Global Invasive Species Database (2019) Species profile: Varanus niloticus. Downloaded from http://www.iucngisd.org/gisd/speciesname/Varanus+niloticus on 21-04-2019. Of the forty reptiles now established in Florida (Meshaka et al. 2004, as cited in Campbell 2007) the most notorious species were identified by (Campbell 2007) as the cane toad (Rhinella marina), Cuban treefrog (Osteopilus septentrionalis), Cuban brown anole (Norops sagrei), green iguana (Iguana iguana), Mexican spiny-tailed iguana (Ctenosaura similis), Nile monitor, and Burmese python (Python molurus). In fact there are now more non-native lizards established in south Florida than there are native lizards in the entire southeastern United States (Campbell 2007). Whole assemblages of non-native lizards (anoles, geckos, iguanids, and teiids) can be observed at most botanical gardens in Miami. With so many exotic hepetofauna using so many introduced plants as habitat Florida is a grand example of invasional meltdown (Simberloff and Von Holle 1999, as cited in Campbell 2007). Reduction in native biodiversity: The Nile monitor is a large intelligent carnivorous lizard which poses a significant threat to the native species of Florida (Campbell 2005). This large lizard has the potential to disperse into ecologically sensitive areas where it could threaten waterbirds, burrowing owls (Athene cunicularia), sea turtles and other wildlife (Enge et al. 2004). Disease transmission: It has been known for many years that reptiles including V. niloticus that were imported into the United States were often infested with ticks which may also be pathogenic to livestock (Burridge and Simmons 2003). A tick potentially carried by V. niloticus is the east African tick Amblyomma falsomarmoreum (Burridge and Simmons 2003). However the captured lizards in Cape Coral, Florida (United States) had surprisingly few external or internal injuries or parasites, and nearly all were in very good condition (Campbell 2005). Currently there are no established systematic operational control methods for the Nile monitor. With funding from the Charlotte Harbor National Estuary Program (CHNEP) and the National Fish and Wildlife Foundation (NFWF), Campbell (2005) set out to investigate this new invader and assess the feasibility of eradicating it from Cape Coral and the surrounds. Monitoring: Field surveys for lizards and their burrows, tracks, and sign were conducted but were ineffective for locating and capturing lizards (Campbell 2005). Physical control: Nile monitors were successfully live-trapped by Campbell (2005). Workers set Havahart live traps baited with squid along canal banks. The lizards were ethically euthanized and were later dissected to reveal their reproductive cycle, diet, and parasite load and to harvest tissues for later demographic, genetic, and ecotoxicological analyses.Campbell (2005) represents a preliminary analysis of this data. Over 100 Nile monitors were captured and euthanized during this study, ranging in size from hatchlings up to large males nearly 2 meters in length and over 12 kilograms in mass (Campbell 2005). Chemical control: Maudlin and Savarie (2010) investigated the use of acetaminophen, a lethal oral toxicant for the invasive brown treesnake (Boiga irregularis) on Guam, as a possible toxicant against juveniles of the Burmese python and Nile monitor. In Nile monitors, acetaminophen doses of 10, 20, or 40 mg resulted in 0, 50 and 100% mortality, respectively. Acetaminophen was found to be an effective toxicant against juveniles of the Nile monitor and Burmese python. Education and Awareness: An emergency response program was established in Florida employing local press releases to motivate the public to report lizard sightings. Legislative measures: Regulatory rules that consolidated laws pertaining to non-native species became effective on January 1, 2008 in Florida, United States. These rules prohibit the release of non-native species and the keeping of certain species as pets. Under the rules, six exotic reptiles including Python molurus bivittatus, P. reticulatus, P. sebae, Morelia amethistina, Eunectes murinus and the Nile monitor Varanus niloticus were identified as reptiles of concern and a permit is now required to possess these species (Fujisaki et al. 2010). Nile monitors are protected under CITES Appendix II and mandatory regulation of international trade is through permits (Levell 1997, Branch 1998, as cited in Somma 2007). Informations on Varanus niloticus has been recorded for the following locations. Click on the name for additional informations. Campbell, T. S. 2005. Eradication of Introduced Carnivorous Lizards from the Cape Coral Area. Final Report to the Charlotte Harbor National Estuary Program, 1926 Victoria Avenue, Ft. Myers, Florida 33901. 30 pp. Campbell, T. S. 2007. The role of early detection and raid response in thwarting amphibian and reptile introductions in Florida. In Managing Vertebrate Invasive Species: Proceedings of an International Symposium (G. W. Witmer, W. C. Pitt, K. A. Fagerstone, Eds). USDA/APHIS/WS, National Wildlife Research Center, Fort Collins, CO. 2007. Bayless, Mark K., 2002. Monitor lizards: A pan-African check-list of their zoogeography (Sauria: Varanidae: Polydaedalus). Journal of Biogeography. 29(12). December 2002. 1643-1701. Bennett, Daniel, 2002. Diet of juvenile Varanus niloticus (Sauria: Varanidae) on the Black Volta River in Ghana. Journal of Herpetology. 36(1). March, 2002. 116-117. Enge, Kevin M.; Krysko, Kenneth L.; Hankins, Kraig R.; Campbell, Todd S.; King, F. Wayne, 2004. Status of the Nile Monitor (Varanus niloticus) in southwestern Florida. Southeastern Naturalist. 3(4). 2004. 571-582. Somma. Louis A., 2010. Varanus niloticus. USGS Nonindigenous Aquatic Species Database, Gainesville, FL.